I spent the rest of the week trying to comprehend what it meant, to come up with a theory, a premise, perhaps even a sermon idea. I saw it, at first, as another concept to understand. By the end of the week, I had realised there would be no walking away with a neat philosophy. This statement of Jesus would be something I would have to learn through the stuff of living life. The LORD descended in the cloud and stood with (Moses), and proclaimed the name, ‘The LORD.’ The LORD passed before him, and proclaimed, ‘The LORD, the LORD, a God merciful and gracious, slow to anger, and abounding in steadfast love and faithfulness. The Hebrew word translated in English as ‘LORD’, could equally be translated as ‘I am who I am’ or ‘I am who I will be’, so this self-proclamation of God contains a statement of essence – God is merciful, gracious, slow to anger, abounding in steadfast love and faithfulness. 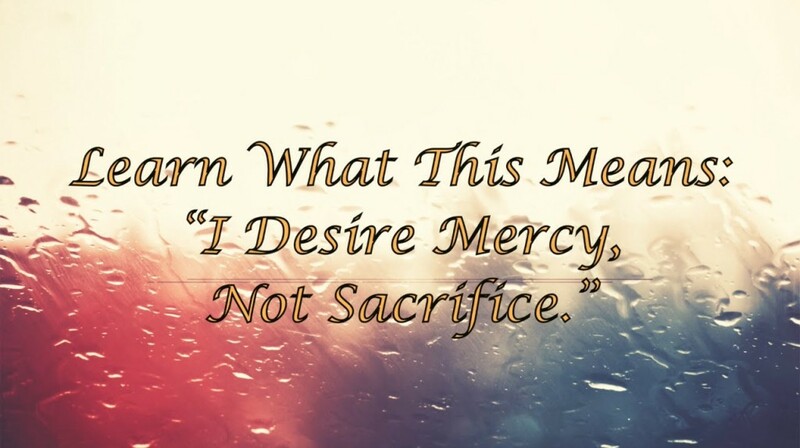 Therefore, learning mercy means learning how to be gracious, how to slow down the rise of anger and and how to remain resolute in my commitment to love. It also means learning fidelity, another underused word. That’s when I realised this idea of learning ‘mercy, not sacrifice’ would be a life-long learning. That was fifteen years ago. I’m still learning.